If the romantic in you is looking for outdoor living combined with a real feeling of history then our restored shepherds hut and gypsy caravan combination is just the thing. 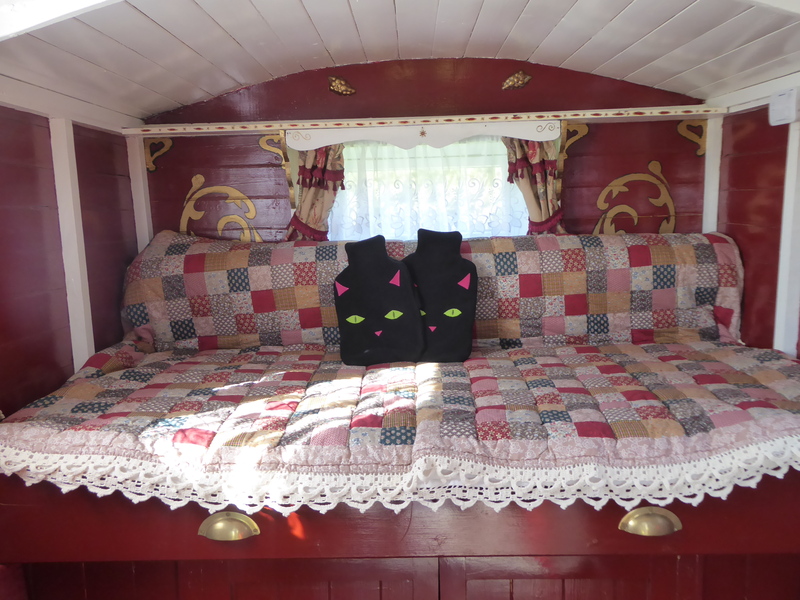 Together they can sleep up to three or four people on two pull out double beds. They are both quite compact spaces as they have been used in the past for one or two people to travel light with a lot less kit than we are used to today. But that is part of their charm and a good lesson to us all! If you have slightly older children who like their own bed space you might prefer our bell tent or Stardome. If your children are very young, or you think that you would like a space where you can all sleep together in the same hut, have a look at our four person living van. 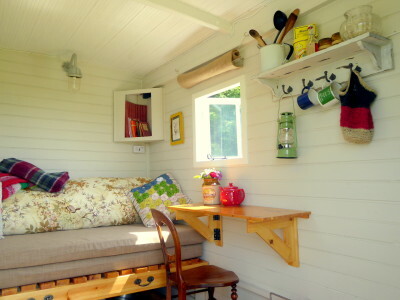 I fell in love with the shepherds hut at first sight when I came across it not too far away from us in Norfolk. Huts like this would have been used locally as temporary accommodation for shepherds, road mending crews or teams taking steam engines around to farms during the ploughing or threshing seasons. We are not sure which is true of our hut, possible all over its lifetime. 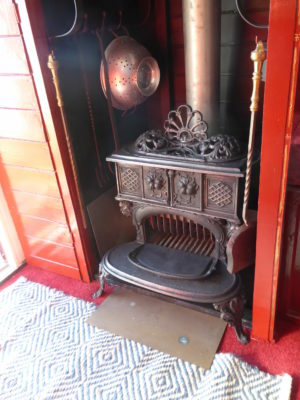 It has been lovingly restored using reclaimed materials and what happened to be at hand, so it is right up our street. We have now completed its restoration inside and have found the hut a home at the top of the meadow. It has been named Ranny, which is Suffolk for small mouse. 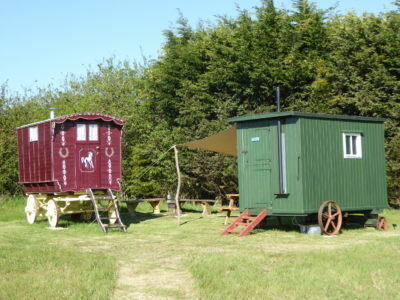 Ranny includes a pull out double bed for two, a fold-down table and seating, but as the hut was meant as a temporary home it is compact and cosy. A stable style door provides both privacy and a view out across the meadow. 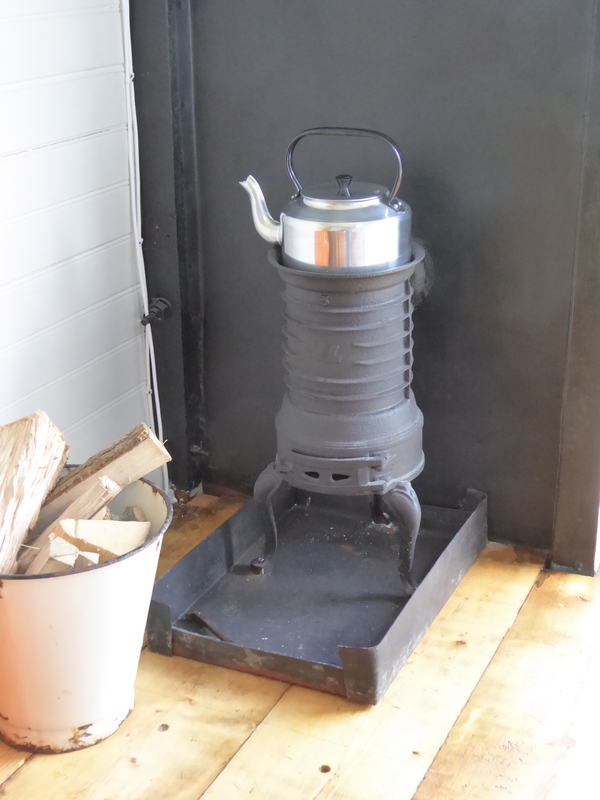 The hut has its own wood burning stove for warmth (although it is pretty cosy anyway) which can also boil your kettle. When word reached us that a gypsy caravan was also for sale locally we couldn’t resist. It was found many years ago on a farm in Cambridgeshire and has been restored with a great deal of care. It has a working queenie stove for keeping you warm. It also has beautifully painted woodwork and decorated enamelware items that have been collected over the years and been given a new home. We have named the caravan, Wren, after my favourite garden bird. We see lots of them around the farm. Wren also has a pull out double bed. The bed is slightly shorter than normal, so it would be the better sleeping option for one adult (or two adults happy to share a cosy space) or two younger children who are happy to share. 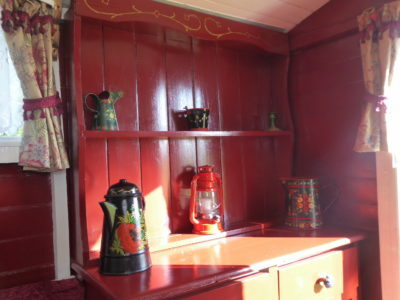 The gypsy caravan has two small seats next to the bed and a side board. It has lots of cupboard space where we store your cooking and dining kit and a stable style door and three windows add lots of light. Ranny & Wren come fully furnished with all the kit that you might need for your stay. 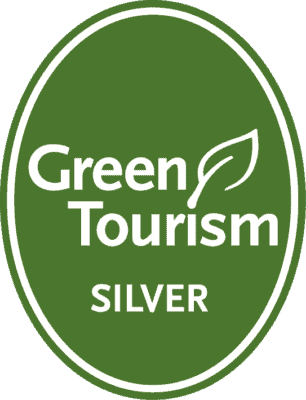 We also include duvets and pillows but you will need to bring linen and towels with you (or you can hire sets for £5 per person per stay). We provide lanterns and fairy lights and the Ranny also has a solar powered wall light. The solar panel next to the hut also provides power for two USB points (in Ranny). You might also find it useful to bring a torch and a camping stove if you have a favourite one at home. Outside Ranny & Wren have their own sheltered seating area and a fire pit with a hot plate to star gaze around at night whilst cooking your tea. 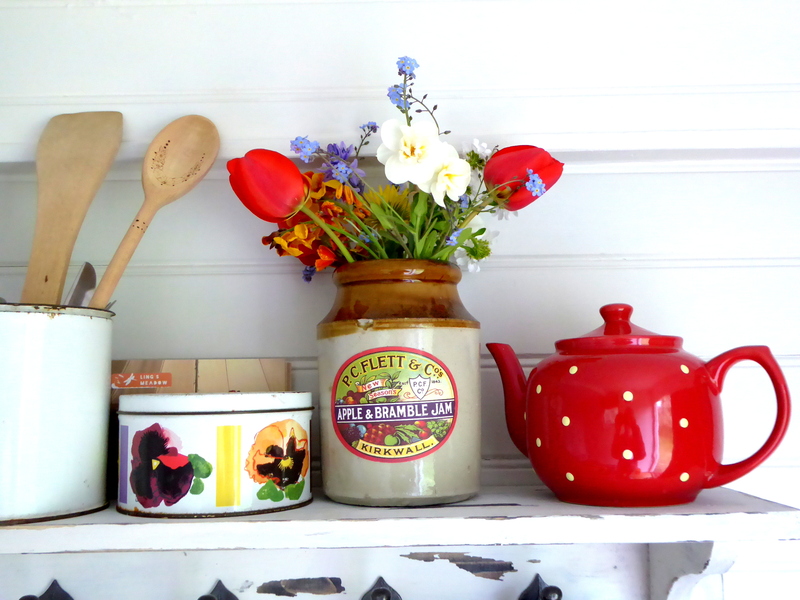 As far as we can we have tried to be true to the history of the hut and caravan, and the ethos of Ling’s Meadow, and want to capture that feeling of simple living outdoors. 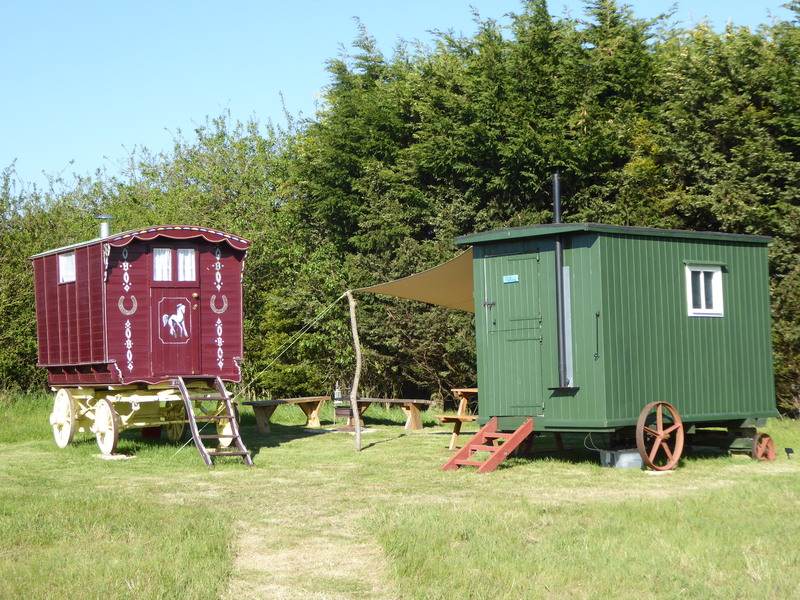 Both the shepherds hut and the gypsy caravan can accommodate up to two people. They can be used either as two separate bedrooms, or as a bedroom and a separate living space. Prices are for Ranny & Wren together. Two night minimum booking (three over bank holiday weekend). No check-in on Saturdays or Sundays. Linen and towel sets are included for a 7 night stay. Sets can be hired for a fee of £5 per person per stay. Sleeps four adults (although taller adults might find Wren a bit of a squeeze) or two adults and two children. Prices are for Ranny & Wren together. Three nights from Friday to Monday, four nights from Monday to Friday or seven nights from Friday to Friday. Linen and towel sets are included for a 7 night stay. Sets can be hired for a fee of £5 per person per stay. Sleeps four adults (although taller adults might find Wren a bit of a squeeze) or two adults and two children.